Since I began writing about foraging over five years ago, I have learned that there are more than just wild plants which are usually overlooked for their culinary uses. Sometimes decorative plants which we have deliberately planted solely for their aesthetic appeal can also provide sustenance and flavour, and are as interesting to use as their wild cousins. Lately I have learned to use some of these landscaping plants such as solomon seel, hostas and roses to name just a few. My Japanese quince bushes (chaenomeles) which I planted from seed a few years ago are just such a plant, and if you happen to have any of these in your garden, there is no need to just let the fruit drop and leave an unsightly mess. And this is the best time of year to harvest them, even after a few light frosts. 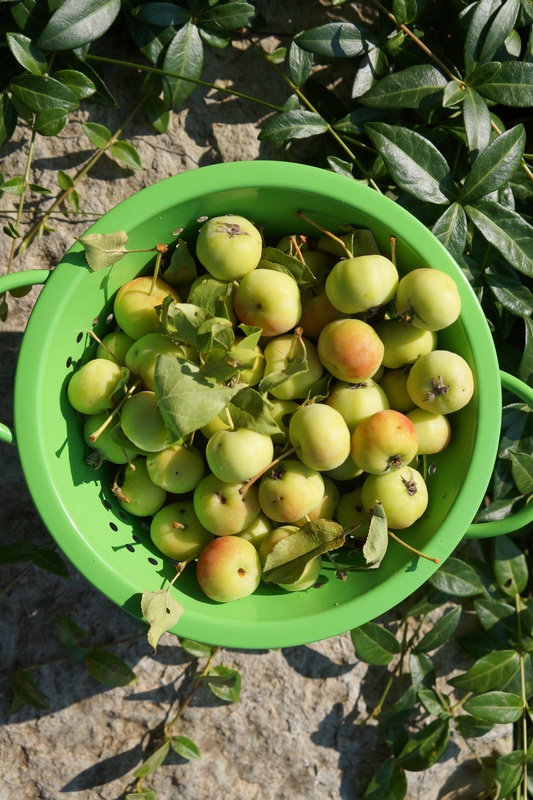 If you have access to real quinces, (cydonia oblonga), they can be used in this or any of the recipes I have previously written, Japanese quince paste, jelly and chutney. This recipe is for a simple condiment, not so much a recipe as a method. Quantities, spices and sweetness can vary according to your preferences, but I will describe the process and ingredients I used as a start. I had about two dozen small fruit, most of them still green. I placed the entire fruits in a pot, covered them with water, and cooked them gently until they were completely soft. I also added one red chili pepper to the pot, even though I wasn’t sure at that moment what I was making. Other spices, such as anis, cinnamon or ginger would also be good. Once the fruit was soft, I strained it and returned everything to the pot. At this point, it is very liquid. Continue to cook until it thickens, stirring occasionally to avoid scorching. When it is almost at the desired thickness, add some sugar, balsamic vinegar, and a little salt. At this point I measured two cups of fruit to which I added 1/2 cup brown sugar and 1/4 cup balsamic vinegar. It then only needs to be cooked until it reaches the desired consistency. And that’s it! This makes a fairly tart ketchup, although the level of sweetness is entirely up to you. If using as a glaze, for example, some extra sugar could be added. It can be used anywhere you would the tomato version, and with its intense, exotic flavour, you may find this a preferable alternative. Categories: condiment, jams and jellies, landscape foraging | Tags: balsamic vinegar, chaenomeles, Japanese quinces, ketchup | Permalink. Having acquired a taste for the most British of pickles, and having most of the necessary ingredients in my garden, it seemed only right that I should create my own version of this family favourite. 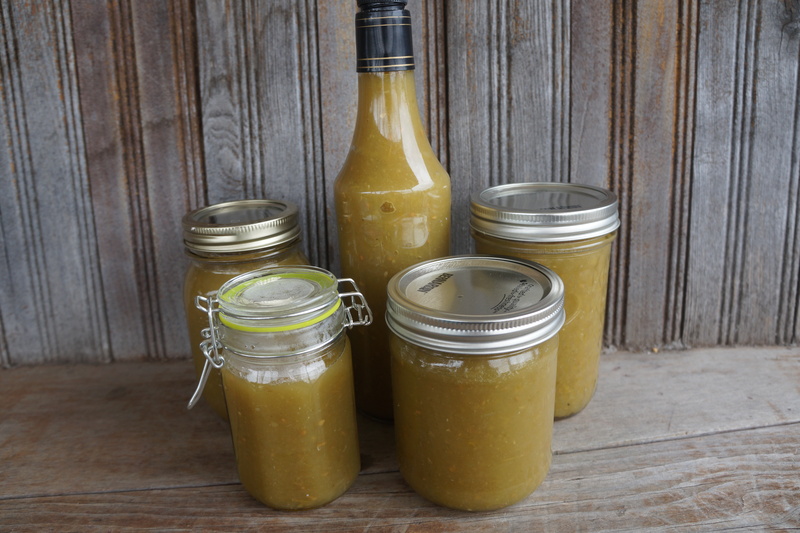 Branston pickle is a relish made with a mixture of fruit and vegetables in a sticky, sweet, spicy, sour sauce. 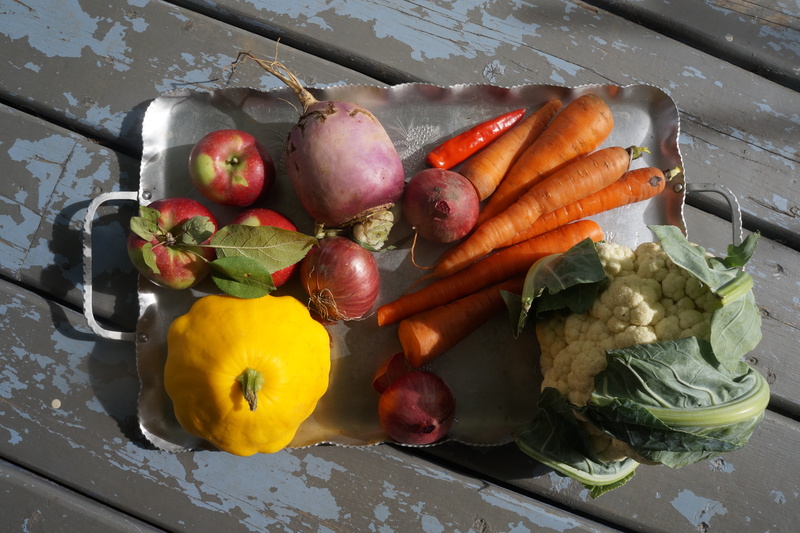 The main ingredients, carrots, apples, turnips and cauliflower are in season right now, so that is what I started with. I made a few changes in order to avoid imports by using nannyberries as described here instead of dates as the sticky sweet part, but if you don’t have any of these you can use dates. Simply substitute one cup of chopped dates soaked in hot water for the berry mixture. Cook the berries, water and sugar until very soft, about ten minutes. Mash and strain. You will have about 1 cup of berry juice. Clean and chop all the fruits and vegetables into small pieces. 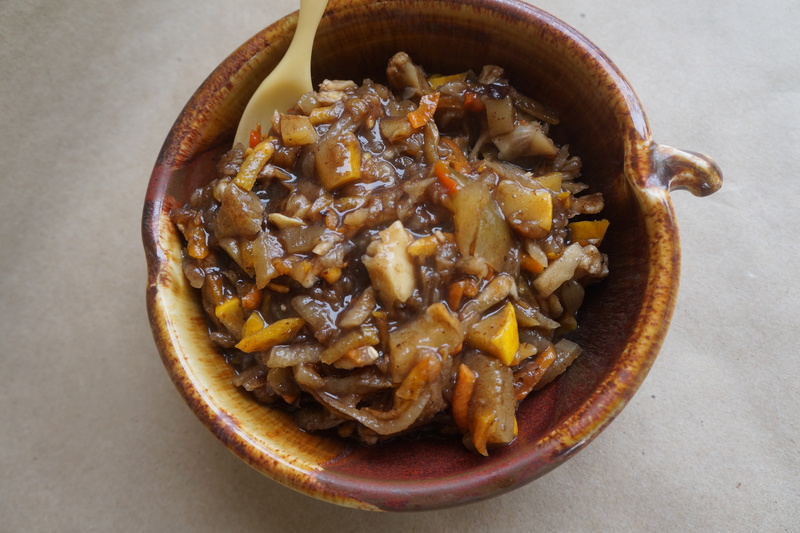 Put everything except the cornstarch mixture in a pot and cook on a medium heat until the carrots and turnip are cooked, but still crunchy – about two hours. Add the cornstarch mixture and heat through until the sauce thickens. Pour into jars and allow to cool. Unsure of whether I could safely can this mixture I plan to freeze the extra amounts. Ideally you should wait a couple of weeks before consuming to give it time to mellow, if you can wait. I couldn’t but I have noticed it just keeps improving with time and we are only at day 8. If you want a spicier version, use the seeds of the chili pepper. The quantities of spices I used are on the mild side, but the flavour is very close to the ‘real thing’. 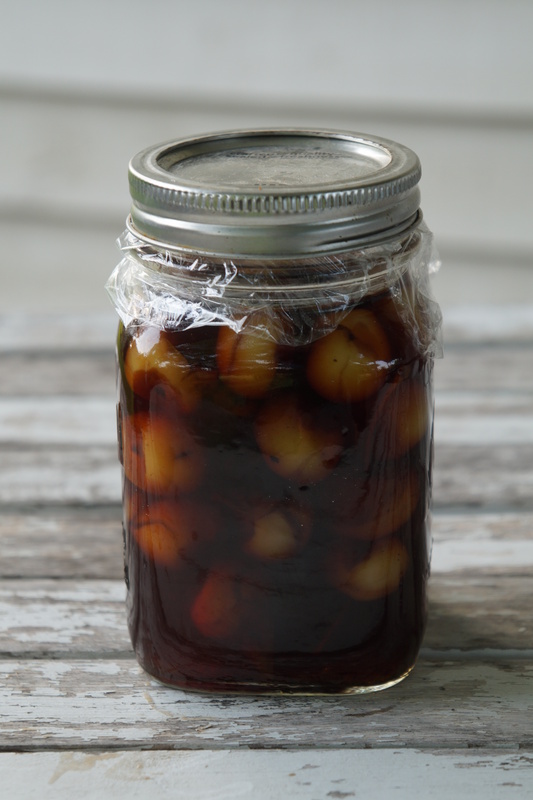 Branston pickle is excellent with cheese or and crackers, cold meats and sandwiches. Linked to Fiesta Friday #89. Categories: condiment, foraging | Tags: branston pickle, Fiesta Friday, foraged berries, nannyberries, pickle, relish | Permalink. I forage mostly within the confines of our property, except for the odd sortie beyond, usually for plants growing in wetlands. Lately I have gone a few feet beyond our property to a vacant, unused field next door for which I have been given permission to trespass. However, another has recently moved in – one who is a much more serious forager than I and who does not understand that foraging should be done sustainably and with consideration for others. I hope this new tenant does not stay too long, but am reassured that at least by winter he will have lumbered off to hibernate. I have not seen him, although his relatives have been spotted only a few hundred metres from our house. I had seen his tracks around my favourite raspberry bushes, but wrongly assumed it was from a deer or raccoon. I shan’t be competing with him for these berries – and if I do I will take my trusty bear horn. An intrepid houseguest did get uncomfortably close to him, and warned me not to venture much beyond our driveway. I’m not arguing. Nonetheless, the berries this year are better than I have seen them since we moved here, so I take what I can and where I can. I have enough to make several delicious recipes, beginning with one for pectin-free black raspberry jam. 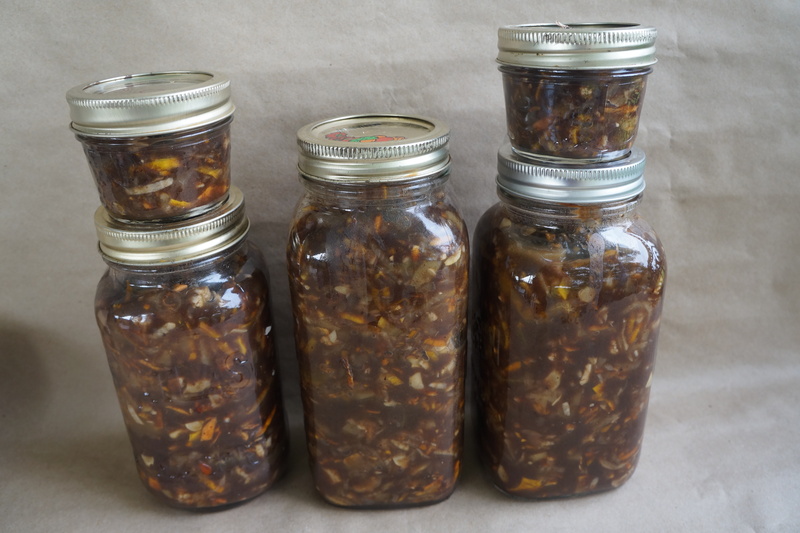 As this recipe is lower in sugar and acid than most jams, I am not recommending it for canning. In a well sealed container it will last a couple of weeks in the fridge or can be frozen. I started by mashing the berries in a pot with a potato masher to extract all the juice I could. For each cup of berries I added one cup of organic sugar plus 1 Tbsp of crabapple paste or dulce de manzana silvestre. 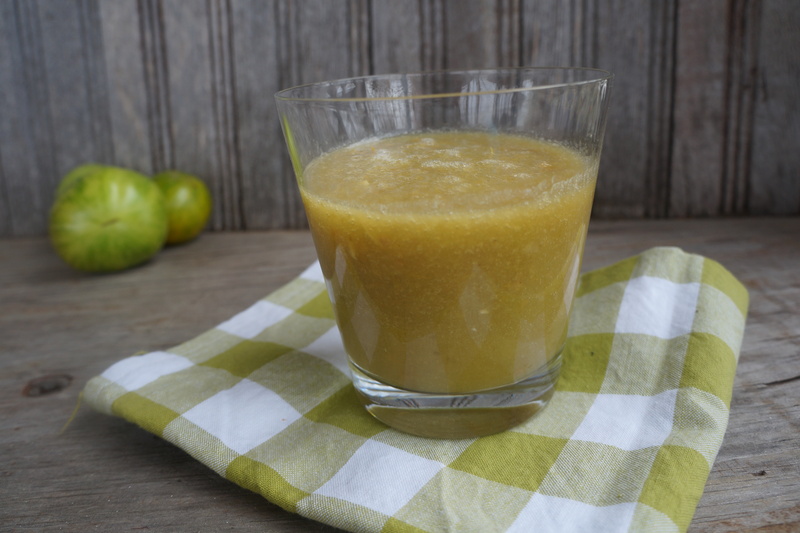 This helps thicken it with its natural pectin. A quince paste would work just as well. 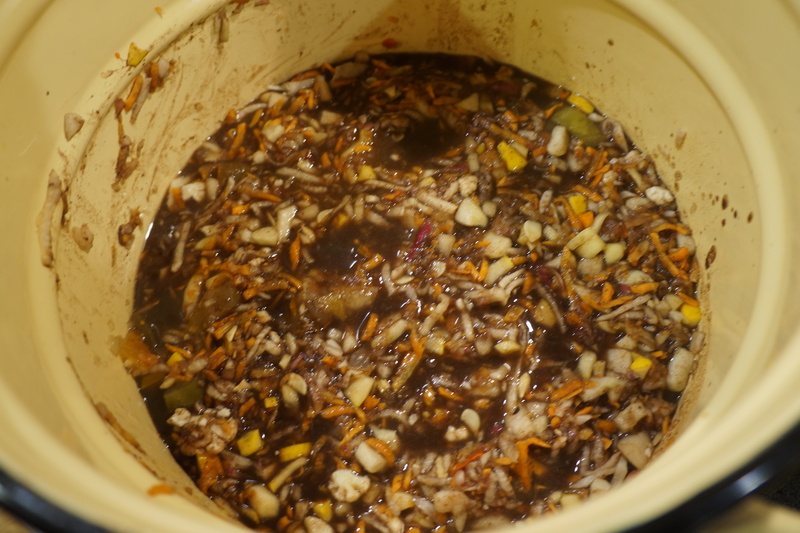 Bring to a boil for five minutes and simmer for a further fifteen minutes, stirring often to prevent sticking. That’s it! Pour into clean jars and seal. The mixture will thicken when cool. It is excellent as a jam, tart filling or topping for ice cream. Categories: condiment, foraging, jams and jellies, preserving | Tags: berries, blackberry jam, crabapple paste, foraging, jam with no pectin | Permalink. Last year at this time I experimented for the first time with lily shoots from the hemerocallis fulva, otherwise known as a ditch lily. 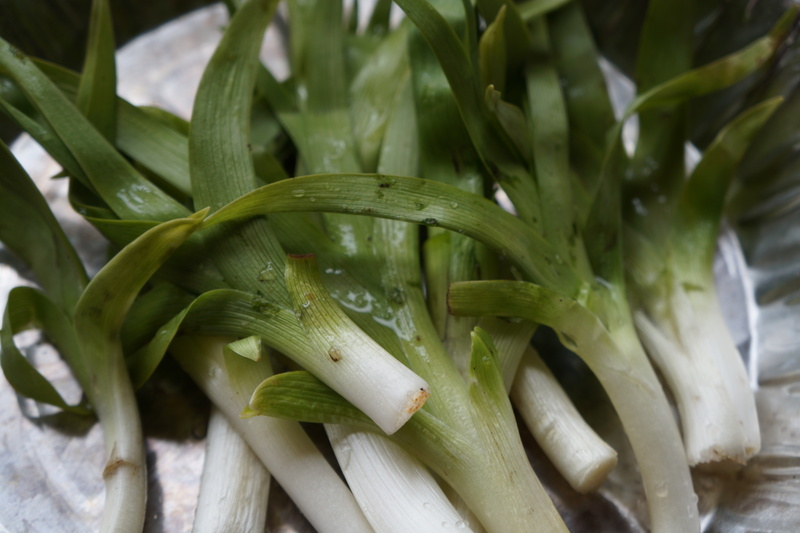 These shoots, if picked in the spring when they are no more than 5 inches high, are similar to leeks but sweeter. I approached them with caution because they can cause digestive problems in a small percentage of the population, but having tried them and found them to be more than agreeable, I picked a lot more this year with impunity. See my original recipe here. 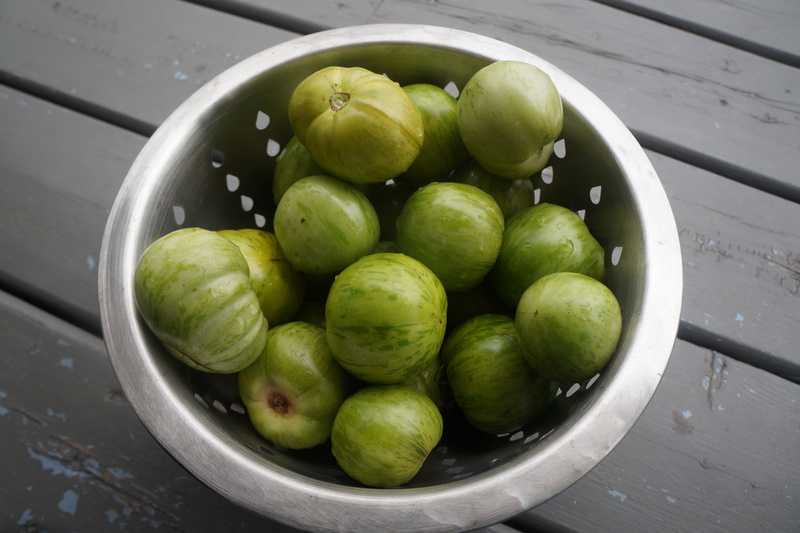 At the same time last year, I also discovered that sturdy leafy plants are ideal for fermenting, resulting in a delicious, sometimes spicy pickle which are a welcome addition to just about any sandwich or snack. So why not increase my stash of ferments with these lilies which are in endless supply – at least for a few weeks each spring. First – some words of caution. Be sure you are picking the above-mentioned lily and not some other day lily, which look very similar. Some of these are edible, but some are toxic. Pick them when they are 5 in. or smaller. After that they get too fibrous. Try a little to make sure they do not disagree with you. Like leeks, they need a good washing to remove any dirt after they have been separated from the tubers. Don’t worry if they break apart. 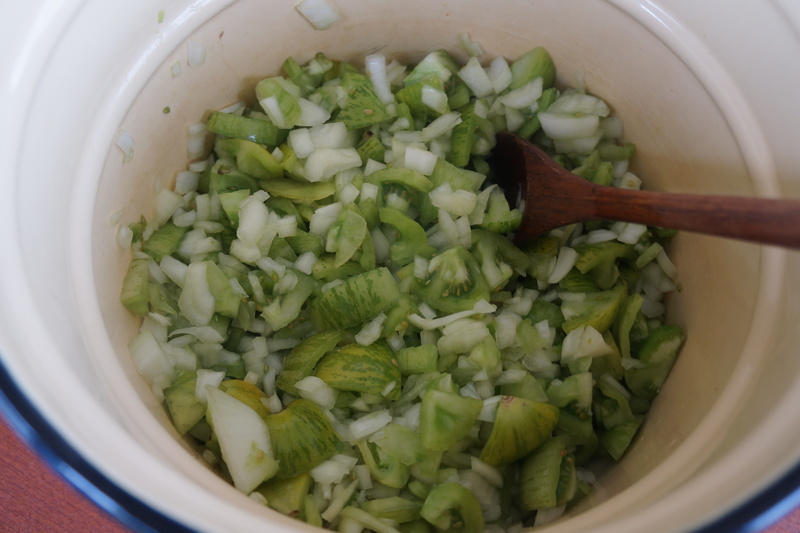 For the ferment, I used 2 tsp of pickling salt for every four cups of chlorine free water. I also added some garlic and slices of chili peppers to give them a little kick and threw in a few of the larger white tubers scraped clean. Pack the leaves tightly into a jar with whatever spices you choose and pour the brine over them. Weigh them down so that none of the leaves are above the liquid. To do this, I covered them with cheesecloth and placed enough marbles on top to hold them down. A stone or other heavy object which fits well in the jar is recommended. After five days, taste a sample to see if they are ready. There should be a good vinegar-like flavour, but if it is not there yet leave them a few more days until they are to your liking. Cover the jars and store in a cool place. Remember, fermenting will still happen, so the flavour will get stronger and you should open the jars once in a while so the pressure doesn’t build up. You will have some of the tastiest pickles for your burgers, sandwiches or salads for as long as they last or up to 6 months at least (my conservative estimate based on my other ferments). 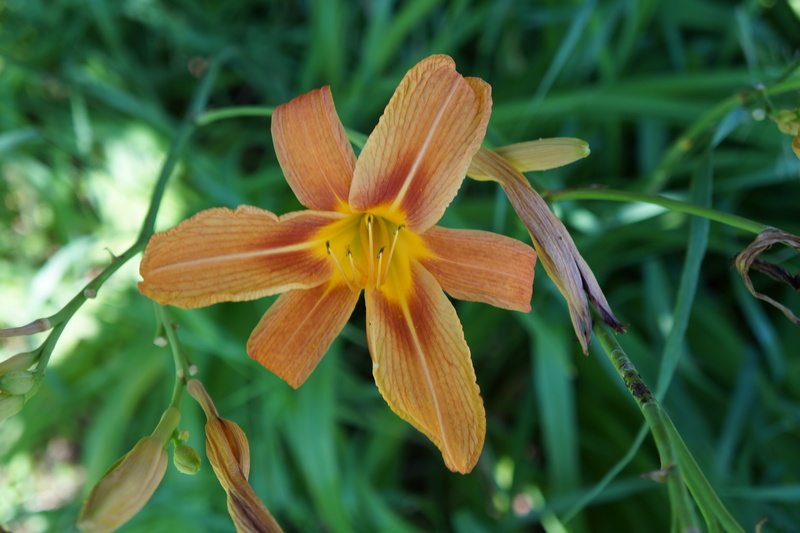 Categories: condiment, edible weeds | Tags: fermenting, foraging, hemerocallis fulva, lilies | Permalink. In my scrounging around for any crabapples I can find this season, I got a few of these very young, green ones. I have recently learned that young fruit has the advantage of having smaller seeds and don’t need much preparation, other than cooking. Coincidentally, I came across a recipe for pickled young crabapples by the Forager Chef whose recipes are always excellent, so I followed his recipe which you can find here. I made it according to his instructions, except that as I had no orange zest I used sumac water in place of that and the water called for. I also only had enough apples for half the recipe which made two jars. If you read his post, you will see that he serves these crabapples with a very elegant pork dish garnished with purslane. If you don’t eat pork, these little pickled apples are tasty enough to be eaten on their own, and as he points out you can use the stem as a little handle. Categories: condiment, preserving, wild fruit | Tags: crabapples, Forager Chef, foraging, maple syrup, Ontario, pickled crabapples, wild edibles | Permalink.